As well as working hard the team at ViewRanger like to get out on their own adventures too, Margie, our Atlanta based business development director, is just back from Canada - here's her trip report. The South Nahanni River is Canada’s premier wilderness river, containing deep river canyons, vast boreal forests, abundant wildlife, and Virginia Falls at 300 feet. 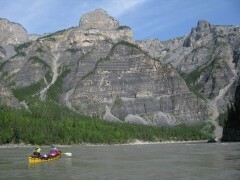 The Nahanni was established as a National Park Reserve in 1974 and was among the world's first four natural heritage locations to be inscribed as World Heritage Sites by UNESCO in 1978. 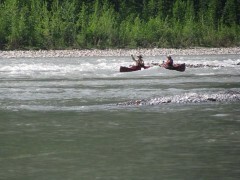 For my big vacation this year, I joined a group of ten wonderful women to paddle the South Nahanni. It took five flights to make it from Atlanta to the top of Virginia Falls, our journey starting point. The last flight from Fort Simpson to the top of the Falls (which is the only safe landing) was aboard a float plane which took both the paddlers and the canoes. 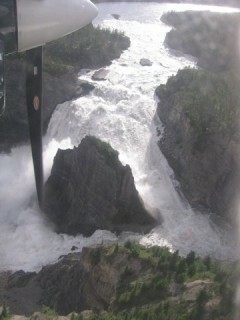 Our pilot gave us a special treat by ‘buzzing’ the falls so we could have a very up close view. For ten days we canoed over 150 miles from Virginia Falls (which we obviously portaged), paddling through many deep canyons with raucous rapids, camping along sand and gravels bars with stunning scenery, and experiencing wildlife both at a distance – black bear, bison, and a variety of birds as well as way too near – a moose, being chased by two grey wolves, crashed through our campsite and escaped into the river. A couple of ‘down days’, allowed us to explore the area by foot including a fun but cold swim through a slot canyon. Our group encountered no one and no signs of civilization – It was such a joy to completely immerse myself in nature, the paddling experience, and our collaborative group (much needed for this challenging river). It seemed like I was going back in time by at least 200 years. The trip definitely re-charged my passion for exploration and adventure.